A crew of 6 skiers are skiing all 27 Colorado mountains in just 8 days for the Colorado Breast Cancer Coalition. This hearty bunch are making their turns at Powderhorn today after a morning at Telluride. 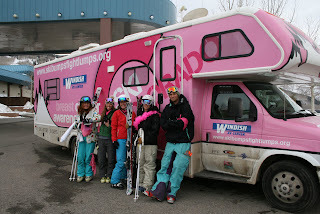 Organizers of the tour are encouraging people to donate to the cause through their website at http://www.skibumpsfightlumps.org/. Let's try this again shall we?